The actress with a beautiful personality and charming looks Alicia Vikander has successfully set her picture in the heart of millions. But people always wonder if she has someone special in her heart. So, the answer is "Yes." The beautiful former dancer Alicia Vikander has been dating an Irish actor Michael Fassbender since last three years. These two actors recently spotted strolling on a night date in Paris. Let's learn more about this story. We also know that you are eager to know about the love affair and relationship of this amazing couple. So, here are all the answers you were waiting for. Just stay with us. Alicia Vikander and Michael Fassbender who has been spending a quite time and having fun together in Europe and Venice over the past week now appeared with their romantic faces in the city of love "Paris". Alicia and her boyfriend Michael, who are dating since 2014, wrapped their arms around each other as they left the French restaurant Caviar Kaspia after a spot of dinner on July 3. 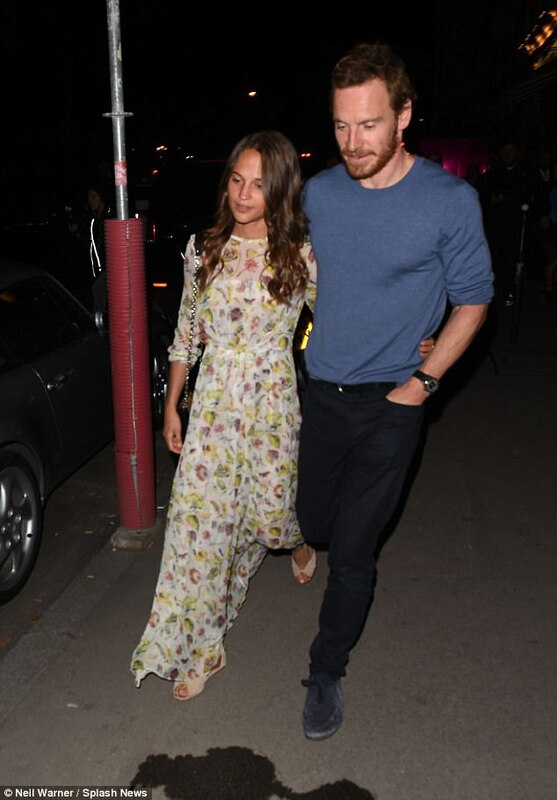 The actress Alicia Vikander looked stunning in a flowing floral maxi dress for the beautiful date night with her actor boyfriend. Alicia dressed in her pretty print number that highlighted her trim figure with its nipped in waist. The stylish star accessorized with a cute pair of ankle-strap peep-toes, ditching the heels in favor of the comfy flats. Her date night outfit completed with a chain-length bag and glossy curly locks. On the other hand, Michael Fassbender kept things casual and showed off his muscular body in a blue sweater and black trousers. These two love birds couldn't take their hands off each other, staying in their cozy encompass as they went to the car. Alicia and Michael's love story begins from the set of their period drama series The Light Between Oceans where they first met and eventually began dating in October 2014. The 28-year-old actress Alica Vikantar is romantically linked with the 40-year-old actor Michael Fassbender ever since their first meeting. Unlike other celebrities who usually keep their romantic link ups far from public eyes, this actor couple never shy or afraid of showing their love in public. They were often seen sharing their kisses on the street and public places passionately. It's nearly been three years of their relationship and their love and passion for each other is gaining more height with every passing day and we don't see any breakup rumor flying around the corner. We wish both Alicia and Vikander all the very best for their future and we hope to hear the news of them tying the knot soon enough. For more updates, stay connected with us.